This cute little item is a TY Brand Beanie. It measures 8 ½” tall. 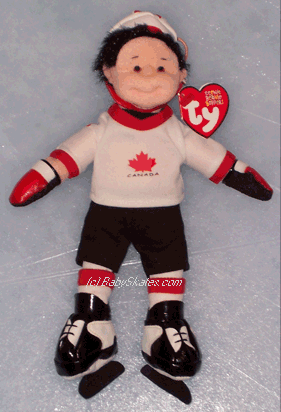 It is little hockey player who is all dressed up in a team CANADA hockey jersey, shorts, socks, bladed ice skates, helmet with black hair underneath, and gloves. On the back of the hockey jersey and on the right sleeve it features the number (10). There is an elastic band sewn in the back neck which can allow for hanging. This little guy is fully poseable and will hold to many different positions. The stitching, colors, and quality throughout are very nice. This is a BRAND NEW item. All tags associated with this item are on it and in BRAN NEW condition. The name of this TY Beanie is Hat-trick Hunter and it indicates that his hometown is Aurora, Ontario, Canada. A true must for any collector, ice skater, hockey player, or fan!